Some people find bicycles boring. Well, there’s not much I can do about that – other than find lots of nice bicycle pictures for you to look at. Fortunately there are a lot of bicycle pictures around. Like guitars and naked women, and some kinds of fruits, there’s something about the bicycle form – its simplicity and grace – that speaks to the artist’s soul. 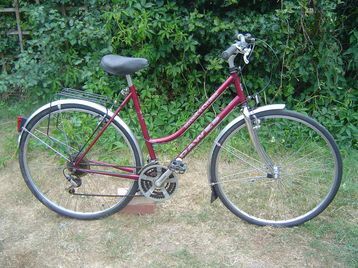 Anyway, my new bike has arrived: the dried-blood-red Dawes from the bike enthusiast named Hans. On Friday I walked it to the bike shop for a quick fix so I could finally ride it for the first time. The people at Brixton cycles are nice – they have a calming presence, like horse whisperers: “And what seems to be the problem here?” They helped me adjust the ancient seatpost and squeaky brake pads. I waved goodbye, hopped on, and set off down Stockwell Road into the crazy sunset of Brixton during rush hour of a weekday morning. I say “set off” but what I mean is more that the gears immediately went into these scary shuddery spasms when I tried to push the pedals around, and the chain went slack and lifeless, and when I squeezed the brakes, they let out an ungodly screech that would’ve been heard in Clapham. I got off, shucked the chain back on, re-mounted. The gears did their twist-and-shout again, making that special knives-and-forks-in-the insinkerator sound. The chain went dead and fell off again. I got off, fussed with the chain. 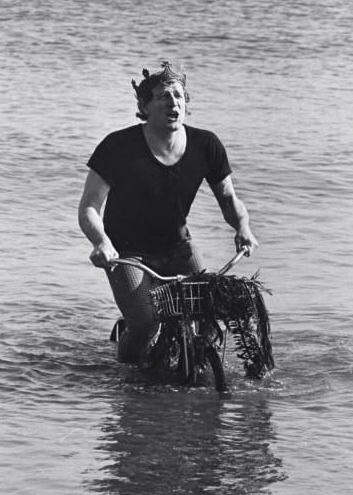 As I was wiping my chain-oily hands on my hankie, a girl went whooshing past on my bike. Well, not my bike per se, but the exact same model of Sirrus I used to own before it was stolen. She had her long hair out. She was glorious. Then she was gone. I hated that girl. Hans from Essex, I hated her. Confession: I don’t like it when people sing as they cycle. Whistling is even worse. There’s something self-congratulatory about that jollity. “Look at me,” the singer/whistler says. 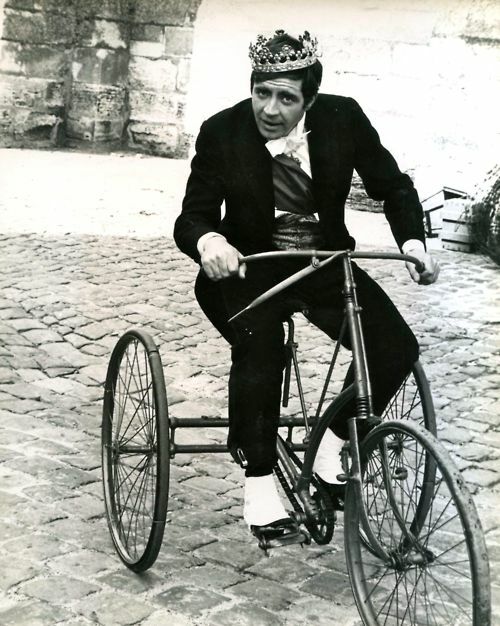 “I’m carefree and joyous as I ride my bicycle.” Suddenly everyone else seems conspicuously silent – joyless, even. Even if the singer/whistler noticed us all glaring, I doubt it would upset them. Because they are so joyous. I’m all for joie de vivre, but it’s not a flamin’ competition. Bitterness aside, I haven’t seen any adults riding trikes in London but I do sometimes see recumbents. A recumbent is basically a bed with wheels. You’re low to the ground on a bench-style seat with your pedals in front. I’ve never ridden a recumbent, but I’ve heard it said that it’s more comfortable than riding an ordinary human bike. Your upper body is supported, you don’t get sore hands or wrists, and there’s no possibility of the genital numbness that can occasionally happen with traditional saddles. Fine. I would argue that, although comfort is all well and good, when you’re riding through peak-hour traffic amongst a jangling crush of other cyclists, it’s OK to be a bit uncomfortable. Discomfort keeps you alert. There are better places to relax than on a road, I think. 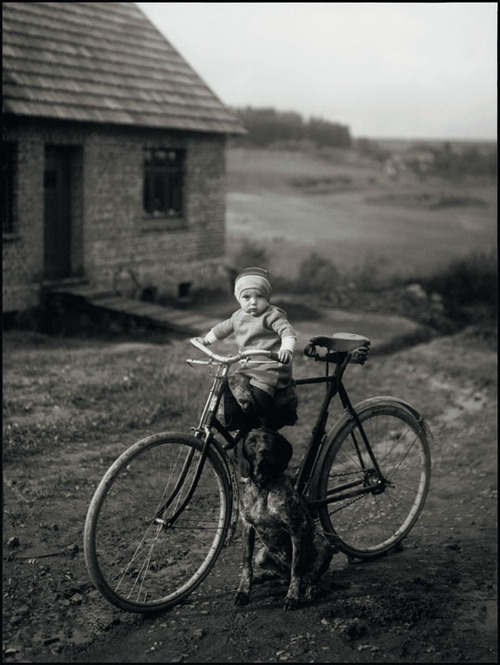 There’s an undeniable grimness in this picture – the dirt driveway, the rickety bike, the modest farmhouse – but there’s a glow around the kid. He looks sort of afraid of growing up but he knows it’s going to happen and then he will have to ride this bewildering machine. The dog is a classic guardian dog, which we can see from its haughty expression and its proud, chesty stance. Also, the dog seems to be propping up the bike. Is that possible? I was waiting at some lights once when a taxi driver started talking to me through his window. 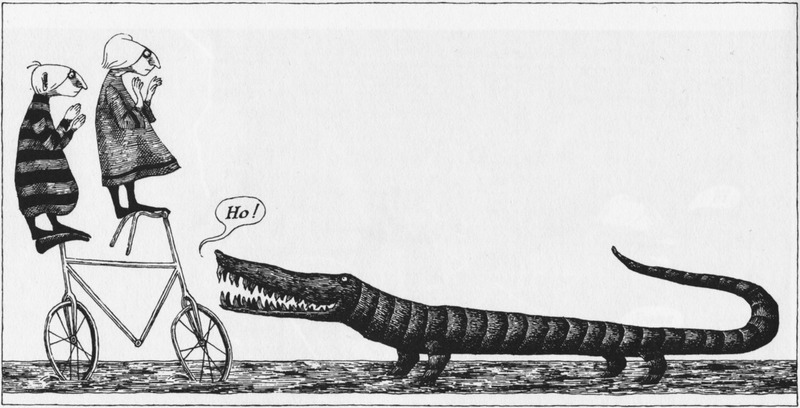 I’d been warned that London taxi drivers are, on the whole, the enemies of cyclists – the crocodiles of the roads. But this guy was very nice for no apparent reason. “Does that keep yer fit?” “It does, it does!” “Not nice when it’s raining though.” “It’s not, it’s not!” “‘Av a nice day then, love.” “Bye!” Maybe I should be depressed that such a banal exchange cheered me up so much. Often when I am walking through Brockwell Park in the mornings I see a man riding his bike with a little kid strapped in a seat perched over the handlebars. They’re always having animated conversations and the little kid is invariably ringing the bell. That would get quite annoying after a while. But I always enjoy this glimpse of fatherly tolerance and tenderness. Young musicians in jeans on bicycles cycling into the future in autumn. 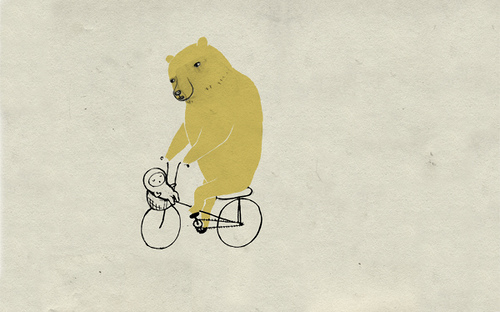 This entry was posted in bicycles, Happiness or not, Uncategorized. Bookmark the permalink. Hey Ash, have you seen this before? Talk about beautifully designed bicycle stuff. I haven’t got a copy yet but planning to. Good luck with your new (old) bike. Did you manage to fix the gears? Oh yeah – I’ve never actually got my hands on a copy of Boneshaker. Looks awesome. 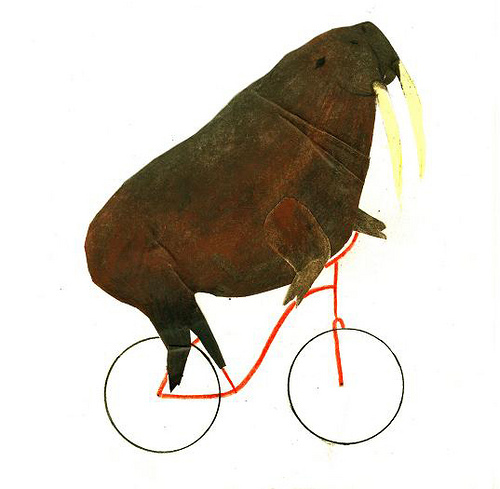 It IS weird about the artistic pull towards bicycles. (I think the poet James Brown is partly to blame.) I feel somewhat uneasy about it – I love bikes and appreciate the explosion of bike-related technology and fashion and discussion and debate, but I resent the fashion-accessory attitude, where riding a bicycle is less about, well, riding a bicycle and more about making a statement about the kind of person you are. Maybe this is more prevalent in London than in NZ? But I’m sure it won’t be long before Wellington is overtaken by fixies. 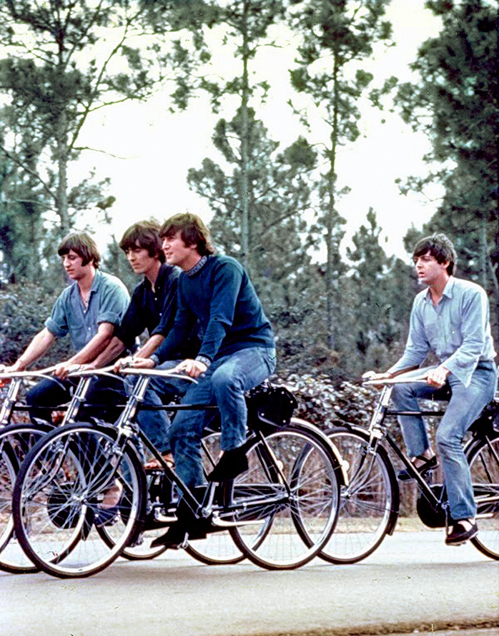 I love how shakey and uncomfortable Paul looks, trailing behind the lead pack of the Beatles on bikes. Hehe. I have the most beautiful bike in the world, which gets almost daily compliments from complete strangers. You would hate me too, because I sometimes sing on it, particularly a nonsense song to the tune of Little Boxes, about my fantasy of filling the wicker basket with poodle puppies. Oh no – that kind of singing is the good kind. I’ve seen a few cyclists in London who have these special carrier things on their backs for carrying small dogs! Like reinforced baby carriers. Particularly good for dachshunds. It’s a great sight seeing a cyclist with dog. I was going to make some kind of chin-strokey interpretation on the Beatles’ riding positions as to their eventual fates – but I couldn’t quite bring myself.